Prostate cancer (PCa) is the most common cancer, and third leading cause of cancer deaths, in American men. So far, only a few well-established risk factors, including ageing and being racially black, are thought to be associated with the risk of PCa. People with type 2 diabetes (T2D) present with higher risks for several types of cancers in comparison to the general population. In the case of PCa, such an association appears to be time-dependent. It has been shown that T2D has variable time-related effects on risk of PCa, with the risk decreasing as time passes and diabetes progresses. The protective effects of T2D against PCa have mainly been attributed to the lower serum concentration, bioavailability and bioactivity of insulin-like growth factor-1 in the later stages of diabetes, whereas it’s elevated serum concentrations in early stages of diabetes are associated with higher risk. Lower levels of testosterone in the later stages of diabetes may also be contributing. Up to now, several meta-analyses have examined the association between T2D and risk of PCa. 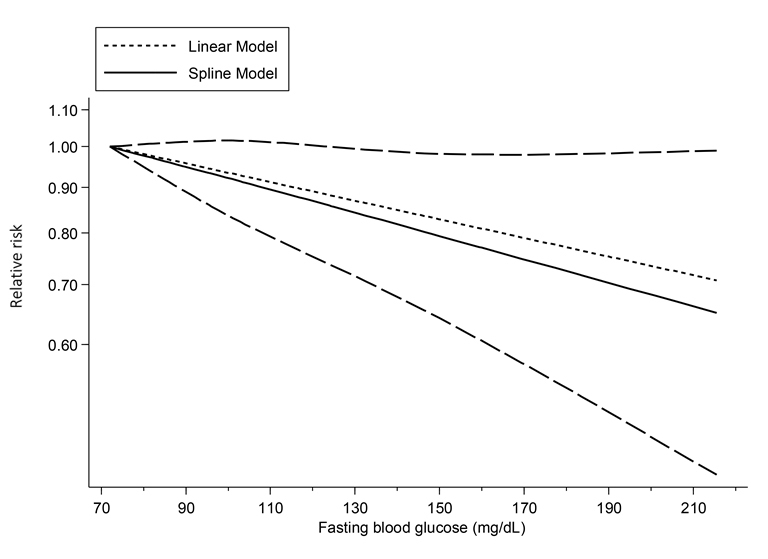 However, the linear and potential non-linear dose-response relationships between fasting blood glucose (FBG) levels and risk of PCa have not been determined yet. Therefore, our goal was to conduct a meta-analysis of dose-response to examine the association between FBG levels and risk of PCa. Fig. 1. 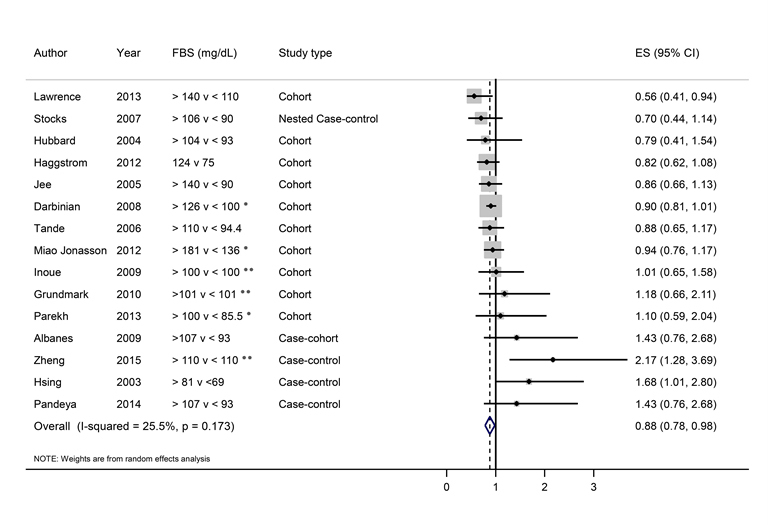 Forest plot of fasting blood glucose (FBS; highest vs. lowest category) and risk of prostate cancer. Pooled relative risk was obtained by random-effects model. *: estimated from post-load blood glucose or haemoglobin A1c; **: studies with only two categories of FBS. ES: estimated blood glucose. A systematic search was done of PubMed and Scopus from inception up to 18 January 2017. Prospective cohort, nested case-control, case-cohort and case-control studies were obtained and included in the present review if they: (1) measured fasting or post-load blood glucose or haemoglobin A1c; (2) reported blood glucose concentrations as per at least two categories; (3) reported the outcome of interest as PCa incidence; (4) reported risk estimates and the corresponding 95% confidence interval (CI) of PCa incidence for each category of blood glucose level in participants aged > 18 years. A random-effects dose-response meta-analysis was conducted. Ten prospective cohort studies, one nested case-control study, one case-cohort study and three case-control studies (total n = 1,214,947) involving 12,494 cases of prostate cancer were reviewed. Figure 1 indicates that higher FBG levels were associated with a 12% reduction in risk of PCa (pooled RR: 0.88, 95% CI: 0.78–0.98) with no evidence of heterogeneity (I2 = 25.5%, Pheterogeneity = 0.17). None of the excluded studies changed the pooled RR in any meaningful way. In the subgroup analyses, a closely similar result to the main analysis was found in the subgroup of cohort studies (pooled RR: 0.87, 95% CI: 0.80–0.94, I2 = 0%, n = 12), whereas analysis of the case-control studies suggested a positive relationship (pooled RR: 1.70, 95% CI: 1.13– 2.28, I2 = 0%, n = 3). When the analysis was restricted to cohort studies only, a significant inverse association was found, but only in those with a follow-up duration > 12 years compared with < 12 years. On examining the non-linear trend between FBG levels and risk of PCa, meta-analysis found a very slight decrement in risk with increasing FBG levels. When the analysis was restricted to cohort studies only, the summary result found that the risk of PCa dropped sharply across all FBG strata (Pnon-linearity = 0.97, n = 9 studies; Fig. 2). Fig. 2. Dose-response relationship between fasting blood glucose and risk of prostate cancer in nine cohort studies (P = 0.97 for non-linearity). The present meta-analysis has provided supportive evidence regarding the proposed inverse association between long-term diabetes and risk of PCa. Our results have shown that the risk of PCa decreases linearly in the long term as FBG levels increase from baseline levels. However, with the inclusion of case-control studies in the analysis, the summary results suggested less PCa protection. Thus, these results need to be interpreted with caution. Fasting blood glucose and risk of prostate cancer: A systematic review and meta-analysis of dose-response.